It is with a heavy heart, I bring sad news. One of the foster kittens in our program passed away yesterday. He was one of five kittens born to GiGi just four weeks ago. Although things seemed all right in the first weeks, over time, the little fellow didn't grow the way his siblings did. He remained quite small and before we could intervene, he slipped away into the ether during the night. I realize that this is part of doing animal rescue. Not every single cat who comes to us will have a happy ending with a perfect family. There have been plenty of sleepless nights, over many different health crises. Luckily, many times things go well, but the times when it does not, those are the ones that stick with you. I had to leave work early, I was so upset. Maybe I'm a big baby, but it really hit me to find out he died. I realized I took the only photos of him, when I saw them a few weeks ago. I wondered which kitten had died, but I was too scared to know. I just saw them about two weeks ago. Once I got home and had a good cry, I went up to see my own foster kittens. One of them blew a bubble out of his nostril! They're all sneezing, but they all have good weight, are starting to play, and seem to be all right. I called our Vet and got some suggestions, but for now I have to watch them and wait. I'm on pins and needles with worry. They're going to be three weeks old tomorrow, no where near out-of-the-woods. I think it's going to be a long few weeks of worrying. Let's take a moment to think kind thoughts for a little black kitten whose life was cut cruelly short and who, I hope, will be reborn and come back to us again soon. Rest in Peace, dear one. Rest in Peace. Day 16. Stop! In the Name of Cute! Admit it. This hurts it's so cute! Read more about Day 16. Stop! In the Name of Cute! Ears starting to perk up. Follow the story of this and other kittens! Visit my Foster Cat Diary! for more. —a gorgeous feral Mama (not pictured yet) and three teenie-weenie babies! What should their names be? Leave a comment here with your suggestions! Read more about Pi Babies! Kitten Season is in Full Bloom! 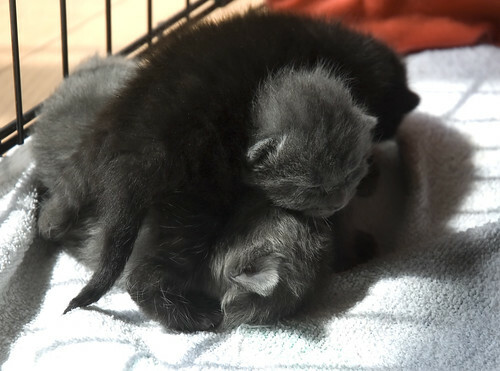 On March 11th our foster, Gigi gave birth to FIVE healthy kittens! The photo below was taken just 10 days after they were born. Yeah, the photo is a bit dark. I did what I could. If you look closely you can see them squirming or nursing on their kindly Mama. She's truly marvelous with her young ones. Next week, I'll begin chronicling my time with my newest foster, Mama-cat. She gave birth on Pi Day (March 14th) to three kittens. I don't know anything more about them than that, but I'm already reading up on setting up a proper nesting box, how to keep the room nice and warm for the babies, what to feed mama and so on. I have their room all ready to go and I can't wait to meet them. I've never fostered kittens younger than four weeks old, so this will all be new and wonderful. Of course, I'll be posting LOTS of pix on my Flickr pages, as well as a few shots here. Read more about Bring Out the Babies! It's been a long few weeks since I've had any foster cats. Spring kitten season is in full bloom and we've already taken in our first pregnant Queen. 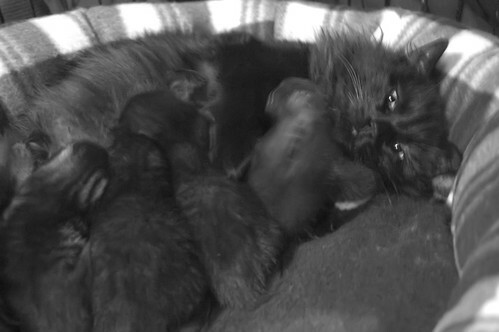 GiGi, a black, long-haired, beauty, gave birth last week to five lovely kittens. I'm going to visit them in two days and hope to get some photos of the new arrivals. GiGi is with one of our other foster families, and good thing, too. She's such a beauty and so well tempered I know I'd have a hard time giving her up. I bet she has some pouffy offspring. Ooo! How I love long-haired cats! I was truly heartbroken to see this article last night. A tornado hit the farm of a sweet Georgia couple, who dedicated themselves to working with dogs. Mrs. Bonnie, as she was called, was thrown 50 feet during the storm and died. She was probably trying to save her dogs, many of which were lost or killed. Take a moment out of your day to think good thoughts or send a prayer to Mrs. Bonnie and to her husband, Michael, who is in critical condition as of this post. You can visit their web site here. and send them your kind words, directly. Rest in Peace, Mrs. Bonnie and all those rescue pups. Spencer's had a breathing problem since I took him in as a foster six years ago. Then, I was told Spencer probably had scar tissue built up on his right sinus that was from and old upper respiratory infection and that he would just wheeze for the rest of his life, probably be sickly and that that was the best they could do. Read more about Pet Food Contamination Indictments! Ok. I know this post is a bit late, but heck, I'm lost! I don't have any kitties to foster and I don't know what to do with all this excess time. You'd think I'd work on writing something worthwhile, but that's such a time waster, really! I'd much rather be watching, My Big, Redneck Wedding! Anyway, hope you had a special day! Hope I get some kittens soon! Until then. 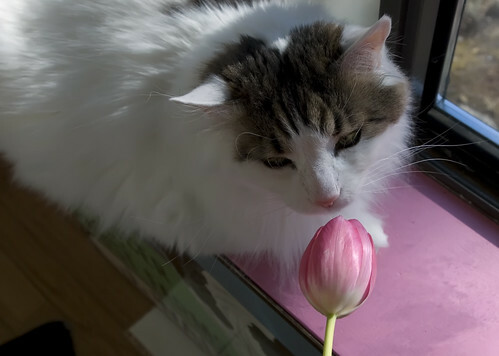 See a cute photo of Spencer and my Valentine's Day tulips. See? 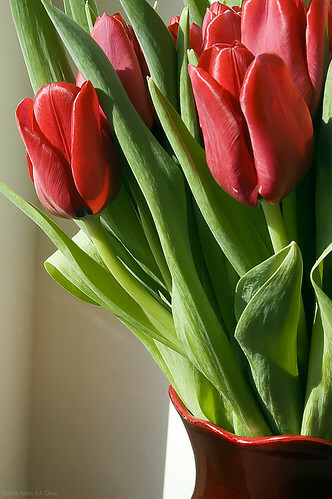 I scored some nice flowers even though I'm mean to my boyfriend!